“Butterfly #1, Lg.” is embossed in gold on medium blue card stock and cut out. The same is done with “Butterfly #1, Sm.”, but two of those are made. “Happy Birthday – Old English” is embossed in gold on a rectangle of medium blue card stock and edged with a gold Krylon Leafing pen. A frame is cut out of Metallic card stock and a background made using blue and gold Brilliance pads on glossy black paper is set behind the frame. The larger butterfly is mounted on the background and the frame. 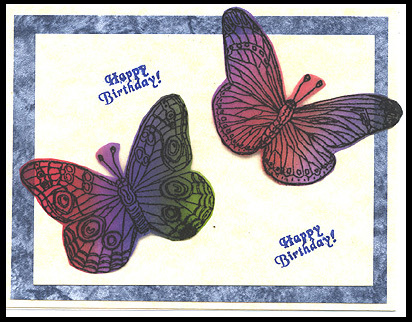 The smaller butterflies are layered two deep on the lower left of the card and the greeting is mounted on the right. A liner is glued inside the card. 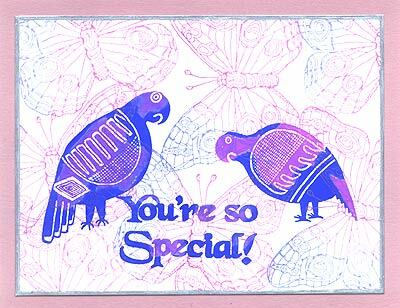 Card by Margaret Wiggin. ” Butterfly #1, Lg.” is embossed in gold on medium blue card stock and cut out. The same is done with “Butterfly #1, Sm.”, but two of those are made. “Happy Birthday – Old English” is embossed in gold on a rectangle of medium blue card stock and edged with a gold Krylon Leafing pen. A frame is cut out of Metallic flecked card stock, and a background made using blue and gold Brilliance pads on glossy black paper is set behind the frame. The larger butterfly is mounted on the background and the frame. 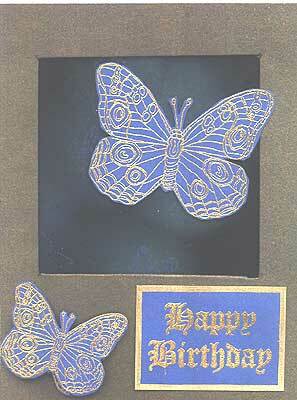 The smaller butterflies are layered two deep on the lower left of the card and the greeting is mounted on the right. A liner is glued inside the card. Card by Margaret Wiggin. 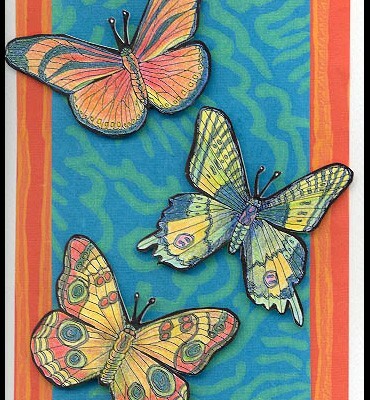 “Butterfly #1, Lg.”, “Butterfly #2, Lg.” and “Butterfly #3, Lg.” were stamped with a black Memories pad, colored with pencils, cut out & mounted on foam dots over background papers that have been layered. Card by Mary Connaway who also drew the images.